The Sapodilla is a ground floor apartment with stunning views of the ocean and offering direct access to the sandy sun deck from the lounge, it also has it's own private patio with BBQ with ocean views. It sits within a group of nine apartments, a manager lives on site. Access to the beach is through a gate on the property. We have manned security between 7.00 pm and 7.00 am and private secured parking should you wish to rent a car. If you're feeling adventurous, experience some amazing snorkeling right in front of the property and remember to be outside in time for those amazing sunset views that we are named after, they are simply breathtaking, we have the perfect location to witness the green flash as the sun sets over the ocean, something considered to be a sign of good luck to witness and believed by some cultures to be a "Glimpse of Paradise" In our garden area we have a swing and playhouse that has recently been remodeled and fitted out with a full kitchen, with parents in mind; we have a comfortable patio set allowing parents to wait in comfort while their food is being prepared and cups of tea are made. Nesbitts, a small local restaurant is located right across the road, offers great local Bahamian food, and some good old fashioned music is guaranteed from their very popular jukebox, a short 5 min walk is the Blue Sail & Deck Restaurants both very popular Turn your holiday into a nature hunt, we have recently added helpful laminated identification cards showing all the Bahamian sea life you are likely to come across on the beach, in our ocean and in our rock pools, feel free to take them to the beach but please return them to the apartments for other guests to use. Please note that over the festive season I only take bookings for a weeks stay starting 16th Dec - 6th Jan.
We loved our place and enjoyed the sunset views every night. Unit was nice and had everything we needed. Buses took us all over the island. Had a great time with all the other people here on the sandy deck. Would definitely stay here again! This was the perfect spot for our vacation! The condo had everything we needed and more. The view is amazing! We would stay here again. Absolutely LOVED the apartment! I will definitely be back!! 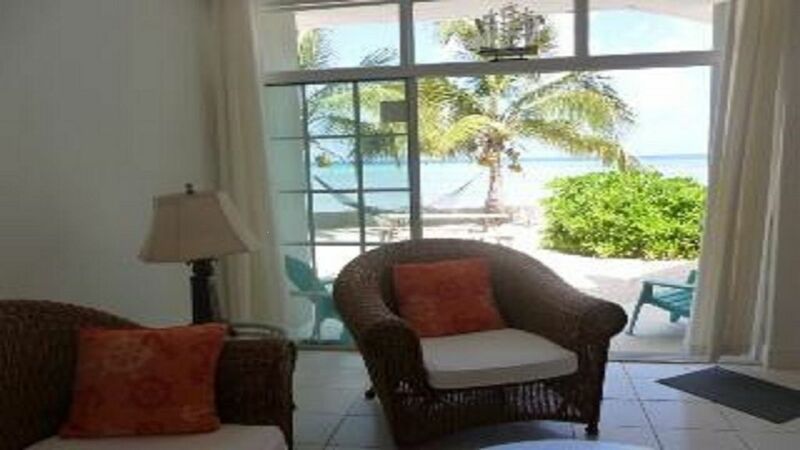 A stay at the Sapodilla Apartment was the perfect end to our Bahamas trip! The quiet oceanfront location with hammocks was great for relaxation and sunsets. The apartment is big, well stocked, and comfortable. It was great to be close to Nesbitts and the conch salad stall for local food as well as on the main bus line. It made getting into Nassau, Love Beach, shopping, and restaurants easy and inexpensive. I would definitely stay here again! Overall Sunset Cove was great. We really enjoyed staying there, using the kayaks, snorkeling, and the sunsets definitely did not disappoint. It is as advertised, a no frills 2br apartment; so don't expect anything over the top as far as creature comforts are concerned. If considering sunset cove, price in a vehicle. While you have access to a bus stop just down the street, the walk along the road can be a little hairy; especially with kids. Also, there is a lot of road noise as west bay street is the main road heading into Nassau. There isn't too much in the way of food that is truly in walking distance, but a bus ride will get you pretty close to where you want to head to. Cabs are outrageously expensive, so if heading to the grocery store ~3 miles up the road, expect the cost to be about 35$ round trip with them waiting for you for 20 minutes. Paradise island for a family of 4 is $80, and the airport is $30. If I had it to do over again, I'd rent a vehicle; its completely worth the convenience and i'd probably come close to breaking even between cab and bus fare. Also, another thing to note is there isn't an outdoor shower or hose to rinse off after hitting the beach, and be wary of the section of beach closest to the road; as we came across a lot of broken glass. Its public, not private, but never crowded and we had the best snorkeling right there. Thank you for taking the time to leave a review, we are happy to see that overall you enjoyed your stay with us and the family enjoyed the snorkeling and kayaks, free for guest use. As for "creature comforts" I am not sure what you mean, you had what anyone would expect A/C, full kitchen, washer /dryer, flat screen TV, phone, free wi-fi & your own personal BBQ on your patio just yards from the ocean. Just a few other points I would like to clarify, you don’t have to walk down the street to access the bus, the bus will stop directly in front of the apartments, all you have to do is put out your hand, it will also take you anywhere along West Bay Street and into downtown Nassau for $1.25. I do agree it is better to take advantage of the taxi we offer guests on arrival, which will collect you from the airport, take you shopping for 20 mins while it waits for you and then brings you to SC all for $35 for 2 people... $45 for 4 people. Nessbits the restaurant right across the road is a favorite of ours, the food is very basic Bahamian I admit, but most guests love it, big portions reasonable prices, I agree for something fancier you would have to go to Blue Sail or the Poop Deck or into Sandyport, where there is Spritz or Twisted Lime all within walking distance that other guests have used. Lastly not sure how you missed the shower that is on the wall in the parking area just as you come off beach and there is also a hose that people use, just after you come in the gate on the left under the poinciana tree.